ecancermedicalscience - Why publish your research with ecancermedicalscience? ecancermedicalscience publishes using a "pay what you can afford" model. If you do not have access to funding, you do not have to pay an article processing charge. We offer an unbiased service to the oncology community to make the latest research available to all. We are fully compliant with the open access policies of funding agencies worldwide, such as the Wellcome Trust and the Research Councils in the UK, the Deutsche Forschungsgemeinschaft in Germany and the NIH in the USA. The electronic submission process is quick and easy and the average time from submission to acceptance is under 90 days. We have a large group of expert peer reviewers and editors working with the journal, as well as a highly esteemed Editorial Board. The journal accepts Spanish submissions. They go through the usual peer review process and, if accepted, are translated into English and published for free, as well as appearing in Spanish. As an online-only journal, ecancermedicalscience gives authors the opportunity to publish large datasets, large numbers of illustrations and videos and the opportunity to include all relevant links (for example, to sequence and other databases, and to other papers), that improve the readers experience. We also offer a free language editing service. Once published, your article will immediately be available to the large number of international visitors to the ecancer website (over 50,000 unique visitors per month from 196 countries) and the full text of each article will be permanently archived within ecancermedicalscience. Additionally, ecancermedicalscience is included in the Web of Science (via the Emerging Sources Citation Index), Dictionary of Open Access Journals (DOAJ) and SHERPARoMEO. Articles are indexed in PubMed, PubMed Central, Europe PubMed Central, Embase, Scopus, EBSCO and Google Scholar, so your article will be highly accessible to other researchers in the field. The full text versions of ecancermedicalscience articles are viewed over 40,000 times a month in PubMed Central. Authors retain the copyright of their articles so are free to distribute them as they wish. ecancermedicalscience features article level metrics, which give authors the ability to discover the wider impact of individual articles in a way that has not previously been possible. Authors are able to track their article across the internet and access statistics on how many people have read their work in a variety of international repositories, social media and online reference managers. Currently, the metrics included are: views of each article on ecancer, views of the full text on PubMed Central, citations in PubMed Central and Twitter mentions. Amalgamated views are shown at the top right of each article, with separate views below the abstract. A wider range of metrics will be developed as more become available. ecancer’s article level metrics are powered by the PLoS ALM open source application. See altmetrics.org, What can article-level metrics do for you? and Alternative metrics for measuring the quality of articles and journals for more information on alternative metrics. In addition, selected articles are written up as news stories and shared with the scientific community as a press release, maximizing the visibility of your paper. We also offer authors a free video interview which will appear on ecancer (11 million video views since launch). Submission is fast and easy. Click here to submit your article now. 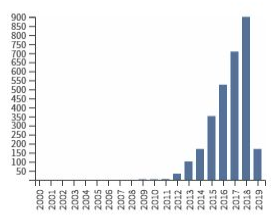 Citations to ecancermedicalscience articles have been rapidly increasing year on year, with a current H-index of 20. Watch this video for authors' personal experiences of publishing with ecancermedicalscience. "I would like to thank the entire editorial group for steering the publication and adding components that increased its reading value. The article went through several rounds of suggestions and helpful inputs for which I will always be thankful. It was a privilege submitting to ecancermedicalscience and I thank you for your inputs/ help/ support." "Thank you again for the effort placed into the reading, editing, and refining the manuscript for publication. We truly appreciate ecancer's model that allows all authors to publish regardless of their financial abilities. " "ecancermedicalscience is dynamic, progressive, far-reaching and with stringent and uncompromising selection criteria, and a truly professional editorial team. It’s been fantastic working with you and your guidance and recommendations improved the manuscript at every stage. It is a great privilege to have an article in such a prestigious journal and to be able to contribute to such laudable activities." "We are indeed very grateful for the support (including financial) that has made this publication possible." "Editorial assistance such as you provide is hard to match"
"I had a great time and a delightful experience with ecancer at the Congress in Salvador, Brazil. All the ecancer team was warm and kind with me and also gave me time and flexible schedule to arrange the interview. I truly believe that it was a great opportunity to expose my ideas and thoughts, since ecancer has an international audience. I look forward to publishing another paper in the journal and will definitely suggest for other researchers to do so." "I would like to thank the entire committee of this esteemed journal for their enormous support towards authors for their high quality publication." "I am impressed with the speed, fees and indexing of the journal as well as with the quality of the articles." "As an organisation that both funds and conducts research it is vitally important that we know the impact that our research is having. With the article level metrics feature on the ecancer website it is easy for us to track just how many people are accessing our publications so that we know our work is having a continuing benefit long after the research has been published." "Thank you for working with us on this special issue. Great job by ecancer." "The innovative ecancer platform gives our work a lot of visibility, with videos and a presence in major conferences." "The submission process was the easiest I ever used, for real - congratulations."